today in the afternoon I browsed through some threads on FPN. There I saw a picture of a modified TWSBI 540 nib done by Pendelton Brown to give them some flex. I thougt this looks interesting. In the evening when I heated up my Sauna (takes about 30 Minutes) the nib modification I saw came into my mind again. This inspired me to do a nib Mod for the Ahab. I call it the "Ahab - Ease my flex Mod". So during my Sauna heated up I did the following. I took the nib out of the pen, marked the orange area in the drawing above with a permanent marker and went to my workbench. There I mounted a round grinding stone to my Dremel and grinded out the marked area. Just put it on a block of wood and held it with my fingers (not mounting it to a bench vice as i did not wanted to apply pressure to the nib). It´s not difficult, to do both sides took me about 10 Minutes. Just try to do both sides symetrically. I think everybody which have a little bit craftsmanship and a Dremel can do this Mod. The transformation regarding the force needed to flex the Ahab was stunning. I took away about 2,5 mm in height (deepest point). When I measure right across the nib from deepest point on the one side to deepest point of the other side the width left is 6,5 mm. Now the Ahab is with respect to the force needed to flex about on the level of my 50s semi flex nibs (a little bit easier to flex than my Pelikan 400 NN). I think you can easily adapt the amount of force which is needed to flex by grinding a little bit more or less away then I did. For my preference the amount I did is perfect. I also don´t fear that the Mod weakened the material of the tines too much. It is still enough left, so don´t worry about that. So i wanted to share my experience with you as I know that many of you also do not like the huge amount of force which is needed to flex the Ahab. The Ahab is also with the modification not a high quality pen but you can transform it to a "real" flex pen regarding the force which is needed to flex it. Till now I considered the Ahab as my worst pen (I also wrote down my experience with it here: http://www.fountainp...ost__p__2587808 ), but maybe I have to reconsider this judgement with this Mod. Edited by Pterodactylus, 21 November 2015 - 20:04. Thanks for this! I tried to give my Ahab extra flex a while ago... unsuccessfully. I went too far, and likely in the wrong direction. I managed to permanently spring the nib while putting it through its paces. NEXT time I try such a thing, I will follow your excellent method. I already started to think nobody is interested in reducing the force needed to flex the Ahab. I would be happy to get feedback from everybody who tried this mod or any other method you used to ease flexing the Ahab. I had the impression that many people are keen to try a flex pen. Unfortunately the possibilities beside a vintage pen to get this experience are more than limited. The Ahab is affordable and has the potential (beside his many weaknesses and flaws) to give this experience. The Ahab is advertised as a flex pen, but if you only tried a real (at least semi flex) flex pen once you will know that the Ahab in his factory default state is no real flex pen. The force needed to flex it is simpy too high. IMHO the line variation has to come nearly effortless when writing to look natural and good. This is simpy not the case with the Ahab in the default state. Even if it produces a nice line (when not railroading) I had always the feeling you are fighting a battle against the pen. Like using a gym training device to train your finger/hand musculature. Ooh! So neat. Thanks for sharing! You make it sound so easy. Hmm.. I wanna try doing this to the smaller nib creaper/standard flex (if I end up not liking it). Edited by Penguin., 02 March 2013 - 01:41. How difficult was it to get both sides of the nib ground down the same amount (i.e., so that the edges were even)? 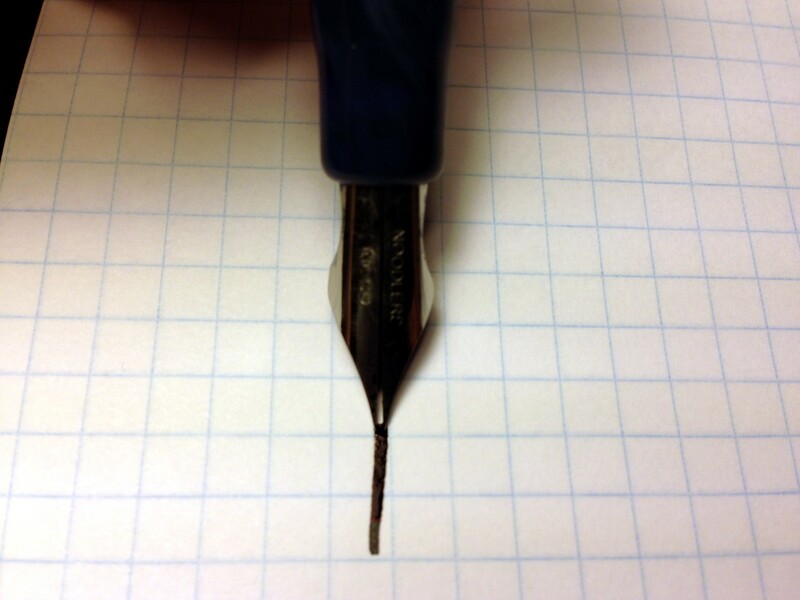 When you put the nib back onto the pen, did you do anything different with how it was seated onto the feed? Edited by Pterodactylus, 18 July 2013 - 17:06. Than you Pterodactylus! I'm so trying this with my Ahab! Excellent work and excellent posting Pterodactylus. Best patent that in case Noodlers copy your idea. Like a lot here I bought an Ahab to try "flex" and while it is fun and a great pen for the money its flex is limited. It was only after acquiring a 50's pen with semi flex gold nib that I realized what real flex is about. 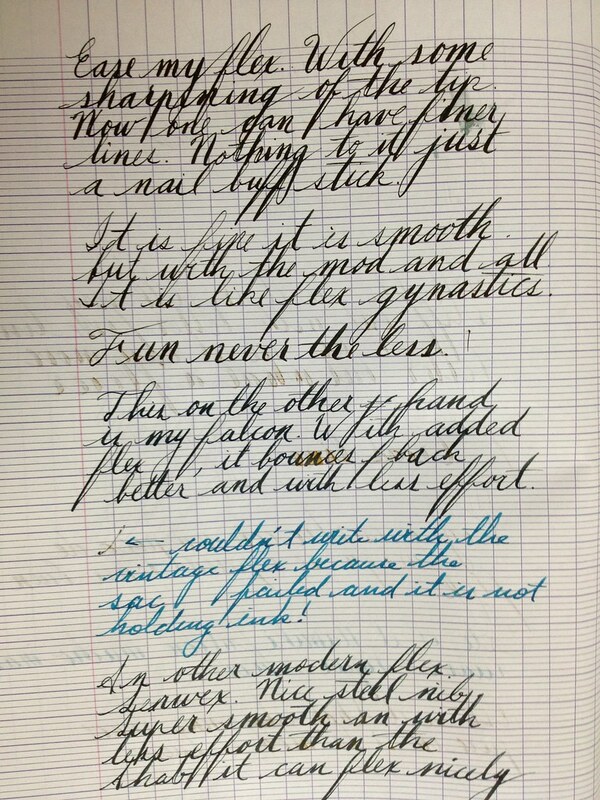 A proper flex nib will "bounce" and create a rhythm as you write. That unfortunately doesn't happen with a Noodlers. I think I'm going to dig out my dremel and give this a go. The nib got not hot. I used a low revolution speed, pressed only gently and grinded not longer than a couple of seconds each time. I'm not sure what warmed the nib more, the grinding or my fingers. Thanks. 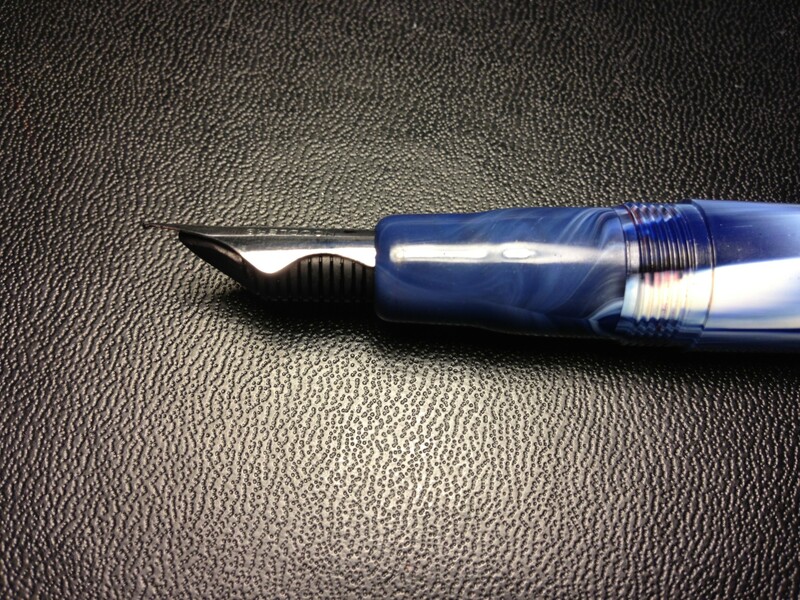 I might also try this on the flex nibs from fountainpenrevolution. At $4 each if I do a bad job not so big a drama. After I seen the Pilot FA nib on the 742 and 743 I always have wondered if you could do the same with the Ahab and Konrad, although I don't have the tools, nor the skill, but looks like it writes great and I can imagine it being easier. The Ahab fits my hand well, has a good balance and holds more ink than any other pen in my stable - but the nib just doesn't quite cut it. Will be in the workshop tomorrow trying to fins my Dremel tool. 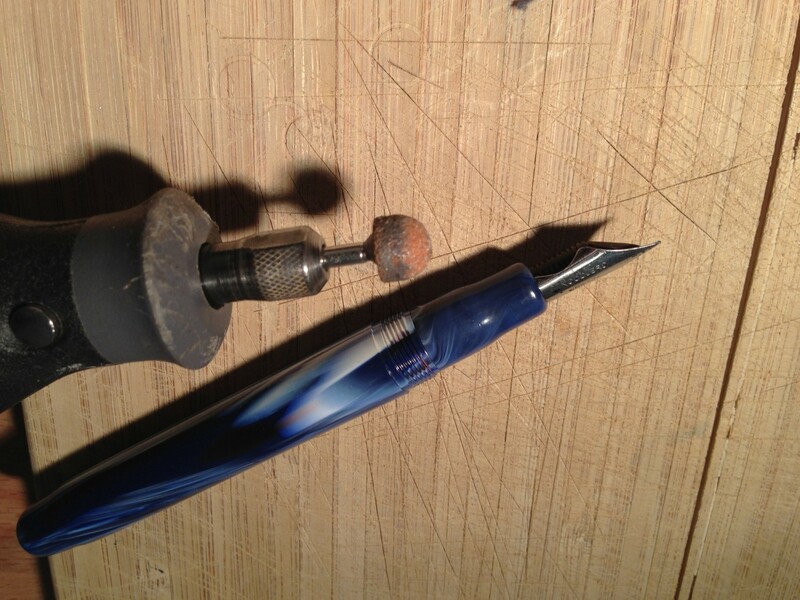 I did it to mine, but went a little further and sharpen the nib to an XF. I is very nice, easier to flex but still to hard to flex. I use it to worm up or workout before I get my other flex pens. What I dont like about my ahab is that it always pases ink from to feed to the inside of the cap. And I don´t know why it is so sensitive to heat variation, although I am using it with the syringe converter. If it does not condense ink to the cap it condenses moisture. Strange. Next my writing sample. With the mods. Edited by Lince, 07 March 2013 - 01:59. 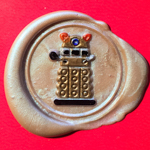 I do not have this dripping issue into the cap as you have (luckily, beside many other flaws). Even I modified my feed again, cut of fins deeper and made the ink channel almost as deep as the Mariana Trench (I fear the ebonite feed will break into two pieces if I will make it deeper) and removed the breather tube to get rid of the nasty railroading. The fins on the feed are now saturated arround the pen fully with ink, but the cap remains clean even when I store it in a vertical position. But a hard buffet will release a ink blob, so I think with my heavily modified feed it´s not the best idea to travel with it. Anyway I think my feed was faulty from the beginning, as the top end (between the tines) of it was chipped away out of the box and I had to grind a new top, which makes the feed shorter than a normal one. When I start writing it is now very wet (as I like it), no railroading at all even when going to the limit. But after a couple of sentences occationally the railroading is back. It seems that the feed is not able to keep fully up if I continously using the flex capabilities. But overall I´m quite satisfied how it writes now (not with the material quality), it is now a nice semi flex with a range from about 0,3 mm to 1.6 mm maximum. The convenient range (at least for me) ist up to about 1.1 mm. Edited by Pterodactylus, 21 November 2015 - 20:09. I think this will help, but I would be careful not to overdo it. I also think the limiting factor of flexing the Ahab with respect to the amount of width you can achieve is the feed. Even I modified the feed quite heavily it seems that he can not fully keep up. Awesome. I'll have to keep this in mind to try out.